Horses are fantastic creatures, there’s no doubt about it. The bond we create with them is so strong that horses literally never forget human friends. However, owning a horse is no easy feat. It requires copious amounts of both time and money. If you’re thinking about adding a horse to your family, here’s what you need to know. The cost of boarding your horse can vary depending on location, services provided, and facilities and amenities available. Board can cost as little as $150 a month or as much as $2500. Your horse will need blankets, brushes, bridles, a saddle and so much more. Expect to pay at least $1000 (on the low end) for equipment. Expect hay, grain, and supplements to run $80-$500 a month depending on where you live and the cost of hay. Horses need annual vaccinations and dental visits plus de-worming every eight weeks. This will run $300-$600 yearly. Horses need their hooves trimmed every six to eight weeks. Some horses will also require shoes. Trimming costs typically run $30-$75 per visit; shoeing costs $75-$300. If you’re new to horse ownership, you’ll need riding lessons. Lesson prices are usually subject to where you live and the level of experience the instructor has, but expect to pay $35-$100 an hour. It’s a good idea to set aside $2000 dollars for emergencies or unexpected expenses. A beginner rider should always choose a horse by its temperament and training, rather than by breed or color. It’s of great importance to spend time with the horse, ride it, and learn as much as you can about its manners, both on the ground and while you ride. It should be calm, willing, patient, level-headed, tolerate mistakes, and be forgiving if you don’t get it right the first time. Young horses, even well-trained ones, are more unpredictable, easier to upset, and more often than not, less experienced. Consider purchasing an older horse as they usually make a calmer mount. Before you buy a horse you should enroll in weekly riding lessons with a reputable trainer or instructor. Spend some time mucking out stalls, brushing and cleaning horses, maintaining hooves, and learning the signs and symptoms of equine medical issues. It’s also a good idea to consider a full or partial lease of a horse for at least six months before buying. When leasing a horse, you pay either a fixed fee or a portion of the horse’s expenses in exchange for riding time. 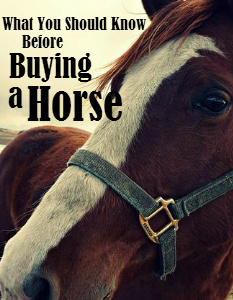 Deciding to buy a horse is a huge commitment — and not just when it comes to finances. You’ll need to visit your horse at least twice a day, seven days a week to clean stalls, provide fresh food, grooming, and exercise. Do your homework and take time to make the best decision possible. As much as you love horses, ownership may not be right for you. There are indeed so many things to consider before getting a horse! Thanks for sharing an overview of some important aspects. @AdminNice post Now i know what is the budget of keeping an horse.ill keep in mind the miscellaneous budget. Good things to consider. Always, always plan for more than you expect to spend. They are oh so worth it though!